GCDkit version 5.0 was released on March 28, 2018. 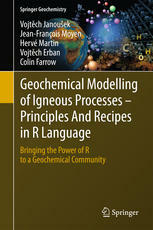 Geochemical modelling of igneous processes – principles and recipes in R Language is a book we have recently published at Springer. Back matter providing introduction to R and GCDkit is freely available! The GeoChemical Data ToolKIT, or in short GCDkit, is a system for handling and recalculation of whole-rock analyses from igneous rocks. It is written in R, a language and environment for statistical computing and graphics. At the moment, GCDkit works under the Windows graphical user interface (GUI), and Windows Vista/7/8/10 are recommended systems. Furthermore, the current version should run under Linux and Mac OSX in command-line (batch) mode. The GUI for these operation systems is close to its release.